Don’t confuse Osteichthyes with large birds that run at high speeds: they’re actually a class of bony fishes with true jaws and bony skeletons. The Tompot Blenny is one of the smallest members of this class of animals. 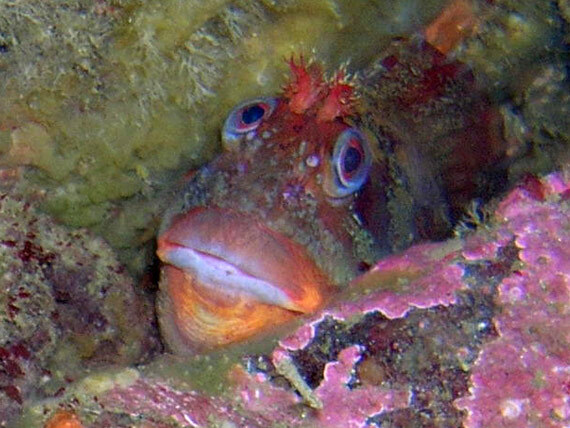 Parablennius gattorugine is better known as the Tompot Blenny, a distant cousin of the goby family, and a familiar sight to British divers. It’s a solitary fish, often found sat on pieces of wreckage or rocks or wedged in a crevice beneath kelp. The spiny body grows to around 250mm in length, and is marked by seven or more brown stripes. 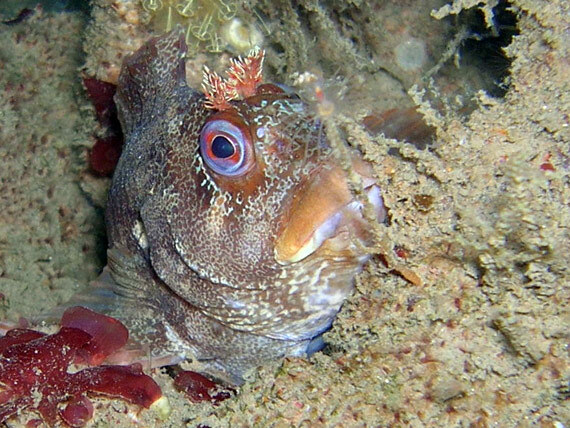 Two oversized, oval eyes sit high on the Tompot Blenny’s head, beneath a pair of small spiny tentacles (known as ‘lappets’).